A frequent question from friends, house guests, visitors. The answer is more complicated than you would think. This week I’ve been reading the latest issue of Outside magazine, the anniversary issue with feature articles from various writers. One in particular caught my eye. An author described how she found her forever home in Creede, Colorado when she against all odds bought a 100+ acre ranch even though she really didn’t have the means to do so. Buying our home here in Nederland wasn’t a long, considered decision. In hindsight, it was pretty rash, and a decision that came from a feeling. It all started innocently enough, when I worked as a Park Ranger at Capitol Reef. An ethnographer who gave a workshop on Native American spirituality introduced me to the concept of the “center place”, the place where you are destined to be, where you spiritually fit. This in turn sparked a conversation with a couple I met from the Florida keys. A couple who most assuredly told me they had found their center place and had never looked back. Then they asked me a life-changing question. They followed up with this. It got me thinking. And thinking some more. What choice could I make, could we make to get us closer to living in the mountains? Fast forward one year later. I’m on a work trip out in Denver for the week. One night at a Homewood Suites near the Denver airport, I start surfing Realtor.com. I decide to look at properties in Nederland, Colorado and I see it. The home I had always envisioned in my mind. A house made of logs, with big windows, and a view of the mountains with pine and fir trees around it. I immediately emailed the realtor — she emailed me back — Yes, I can show you that home, this Friday if you like. Still, I tempered my excitement. Sometimes, homes looked great on the internet, only to find in reality, it wasn’t your forever home. Bryon and I met our realtor Karen that Friday in early spring. 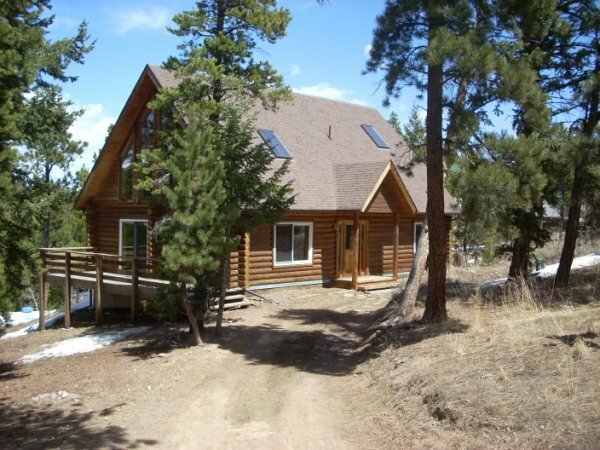 As any good realtor does, she showed us other homes, three of them before my dream log cabin. We pulled up and it looked really modest. We walked in the door, and I knew I had found my center place. It just felt right. I’ve heard people describe the experience of falling in love at first sight with their spouse. Walking through the door, I felt like I had fallen in love instantly. Hard. We bought our house without even having jobs here, and yet every night when I pull up to our little log home on a ridge, I feel content and happy. This vagabond girl who never lived at any address for more than two years since I graduated college, finally put down roots. It’s been eight years and I still feel smitten. I’ve finally found my Center Place.